Showing up to school is the daily starting line for education. When kids miss school it's a warning sign of bad outcomes down the road. Because attendance matters so much, the school finance system is designed with powerful incentives to encourage it. School districts receive funds only for the students who show up. When kids miss out on school, school districts miss out on funding. Attendance records are audited. An ordinary school year in California is 180 days, so the typical threshold for chronic absenteeism is 18 days. In the 2017-18 school year nearly 400,000 students in California were chronically absent, each missing more than two and a half weeks of school. As with all indicators on the dashboard, the color is determined using cut-points set by the California State Board of Education. 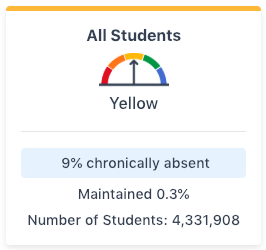 If the percentage of kids who are chronically absent remains the same as the prior year (changing less than one half of a percentage point) the color of the dashboard remains the same. 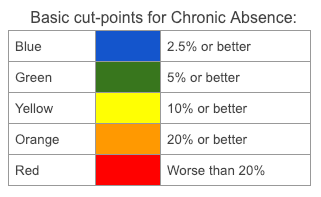 Significant change in the rate of chronic absence can significantly influence the performance color on the dashboard. For example, look at the bottom-right corner of the five-by-five table above. A chronic absenteeism rate of more than 20% is a real cause for concern, but if the rate is improving faster than 3% year-on-year, it might make better sense to celebrate and support progress than to take alarm. Instead of red, the performance color in this case is yellow. When the Dashboard is being applied to a small school (or a small subgroup) of fewer than 150 students, the outer columns are combined with the inner ones. In this "three-by-five methodology" the dashboard shows whether chronic absenteeism got worse, stayed the same, or got better. By eliminating the nuance of by how much, this methodology avoids chopping up the data into groups too small to be displayed. As always, the Dashboard's essential purpose is to help focus attention where it is needed. The point isn't just to look at it, but to use it as a starting place for improvement. Using the Dashboard can help you figure out which schools in your district are struggling with chronic absenteeism. Examine which student subgroups have low attendance and find out why. Going to the data can help reduce biases and make a difference. Using Dashboard data, EdSource has created a search-and-compare tool to make comparisons easier. Across the state, in 2017-18 chronically absent students missed more than seven million days of school, and their districts missed out on more than half a billion dollars in funding. Investments to improve attendance not only help students learn, they can pay for themselves because school districts receive more funds when students show up. This post is the sixth in a series about the California School Dashboard, the state's main tool for monitoring progress in the improvement of schools. If you don't understand the basics about the Dashboard — especially how it blends "status" and "change" — you might want to read the series from the start.